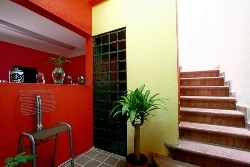 For a friendly place to stay in Mexico City, pick the Hostal San Sebastian located just north of Zona Rosa in the Colonia Veronica Anzures. While being just a short taxi ride from the clubs and throngs, the hostel is a quiet place with good rates and comfortable private single or double rooms. Last updated by jack on 16 February, 2010 in Destinations.